78. KARA at HAVERFOLK in “The White Horse” PH, Chadwell Heath, Essex. Wednesday, 14th October, 2015. + A few words about the venue; the club; and their Open Floor. 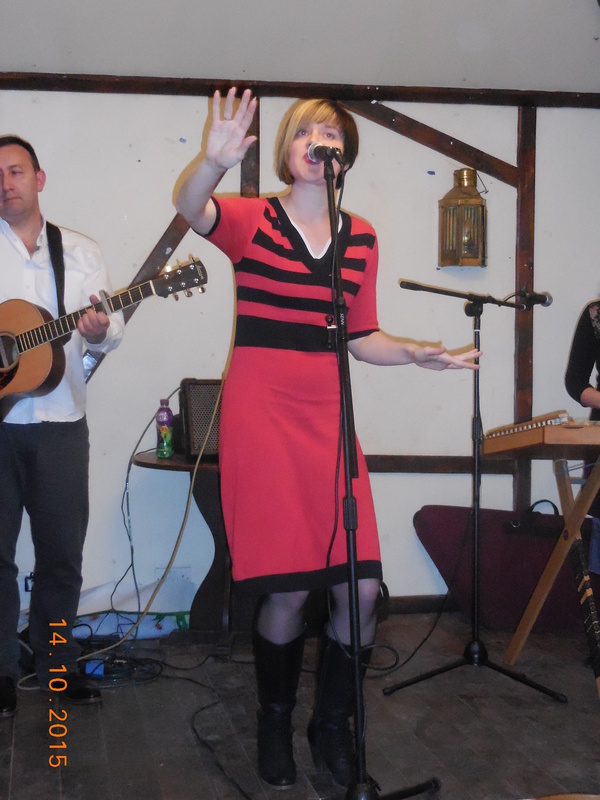 Preamble: I was very pleased to be invited to this gig by Kara‘s Russian singer, my friend Daria Kulesh, back in April when I saw one of her first solo performances, at Lost Horizons Folk Club in East London (See my review #45). I had previously reviewed her excellent debut album Eternal Child; during which I also recommended her band Kara’s seminal work, Waters So Deep (See my review #35). These are both wonderful, unique, and charmingly quirky albums. And a second helping from both Daria and Kara are eagerly awaited! But I hadn’t seen Daria perform with Kara, so I was keen to see her with the band. The Venue: was the 400 year old White Horse PH, in High Road, Chadwell Heath, Essex. The club uses the pub’s ‘Stables Function Suite’ at the rear of the premises, which is accessible from the car park (which apparently is the only pub in Britain to have its own set of traffic lights!) The pub itself is done up quite nicely; but the Landlord maybe could look into a bit of redecoration in the function room. It serves its purpose well enough though. It is a long slender room decorated in a mock Tudor style. At one end is the performance area; and at the other there is a bar (but which was unmanned and necessitated a trek to the main pub for drinks). 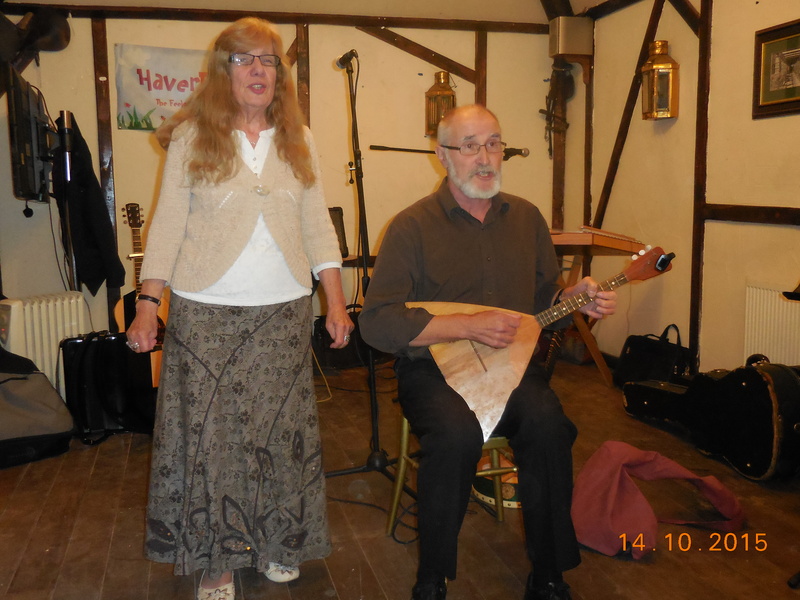 HaverFolk is a nice little Folk / acoustic club, run by Chairman Peter Walters, and assisted by John Foxen; and by Jill and Margaret. 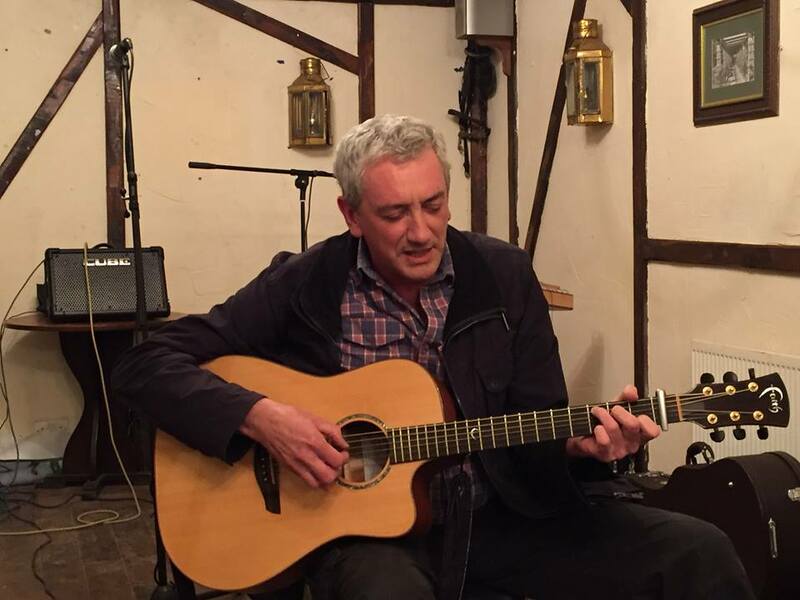 It is known as ‘The Feelgood Folk Club’; and I was certainly made to feel very welcome by everyone I met. The club meets weekly (on Wednesdays, 8 – 11PM) for an Open Session; and about once a month they have a special guest booked. They also get involved in Folk festivals etc. Kara means ‘Black’ in Turkish; and ‘Punishment’ in Russian; and the band describe themselves as playing ‘…spirited acoustic Folk with a Russian twist’. But despite Daria’s Russian origins, she has been living in the UK for some years, and the band are based in Hertfordshire. 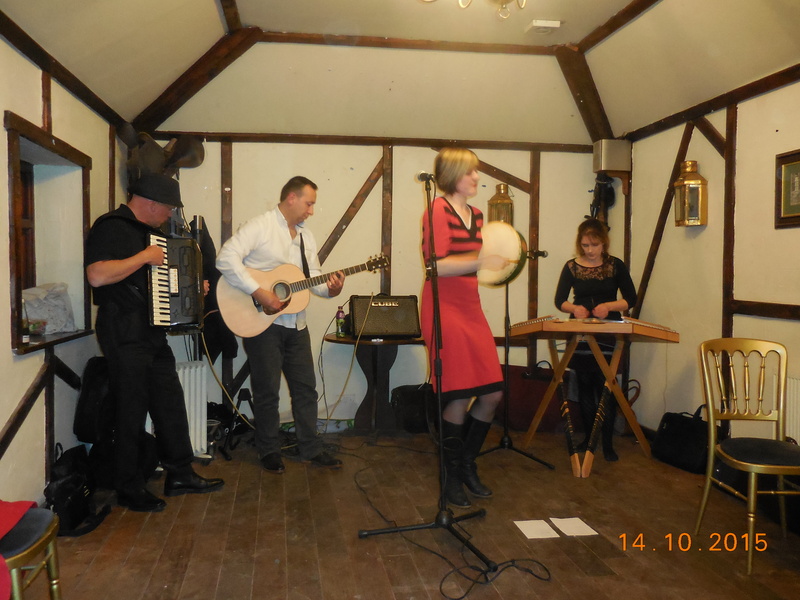 It is a four-piece unit consisting of Daria herself (Vocals, and Bodhrán); Kate Rouse (on Hammered Dulcimer); Gary Holbrook (on Accordion); and Ben Honey (acoustic guitar). From their initials, Daria cheekily refers to them as the KGB! With such an unusual group of instruments, Kara are able to produce some very unique music indeed. The band arrived at about the same time as us; and Daria greeted us warmly; and introduced me to the others. Through their work on the Waters So Deep album, I was familiar with them – especially Kate, who also features on Ange Hardy‘s recent remarkable album Esteesee (See my review #72). It was nice to meet them in person though. 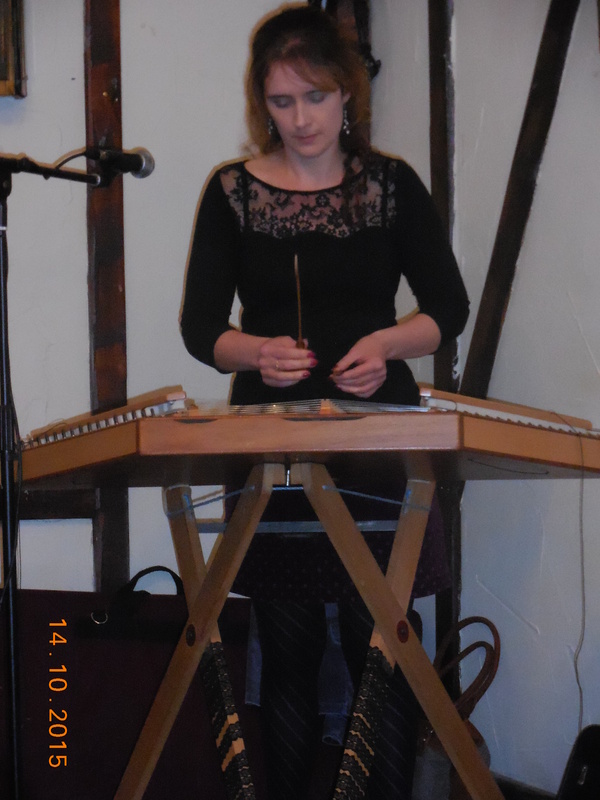 Kate gave me a brief explanation and demonstration of her Dulcimer, which I found fascinating to hear and see played. Open Floor There was no support act for Kara – there being enough talent among the club members themselves to fulfil that role; so it is usual (as it is in many Folk clubs) for there to be an ‘Open Floor’ spot where anyone can perform a song or two before the guest plays their set. So on this occasion, several of the regulars would perform one song each. Of course, there were a variety of styles and talents present which made for an interesting warm-up. Master of Ceremonies John Foxen started proceedings by pulling a Balalaika out of its bag, which he said had been in his loft for years, and had been fetched down in honour of the evening’s special guest! He was joined by Mab, and they played a fun version of the Russian Folk song ‘Stenka Razin’ with the chorus somehow transliterated from ‘Volga Volga’ to ‘Vodka Vodka’! The best of the other floor spots were, in my opinion; by Ray Spillman who gave us a very good cover of Ralph McTell’s ‘From Clare To Here’ on his lovely Faith acoustic; and by Dave Wilson who covered ‘Silver Raven’ by Gene Clark of The Byrds. But all of the other Floor Spots – from Jane, Tony, Johnny and Clive – were good too. But just when we thought the warm ups were over, I was challenged by MoC John, to come up and do a number! Well I hadn’t planned to do so, but not wishing to seem churlish, by writing a review of others without performing myself, I willingly rose to the occasion! I borrowed Ray’s Faith acoustic; and the first Folky song that popped into my head was Mike Batt’s ‘Soldier’s Song’ – or at least, my rendition of it – replete with myriad mistakes! Thinking about it afterwards, I don’t think I’ve played in public for almost a year. I got some applause but I offer no critique! Kara’s First Set Then it was time for the headliners, Kara. After an interesting spoken introduction from Daria, during which she described the band’s eclectic music as ‘..a crazy cocktail’; they began with the beautiful ‘Rusalka’ – which is based on a Pushkin poem. I love this song; and this performance was as perfect as the album version – and a perfect intro to Kara’s music, with the ‘KGB’ each demonstrating their respective skills right from the start, and Daria’s beautiful voice in fine form. If we needed more proof of this, we received it with the remarkably named instrumental ‘Flying Spaghetti Monster’; and for this, Daria took up her Bodhrán. ‘Seaview’, a chirpy song that I didn’t know, inspired by the Isle Of Wight was next. We were then invited ‘…to venture into uncharted territory – the mysterious domain of the Jazz Dulcimer’! This is a song about powerful City men: ‘The Dance Of Devilry’. From their album the band then gave us the lovely ‘Mermaid’s Lullaby’, introduced by Kate. Sung in Russian by Daria; and with lovely reverb’ed guitar from Ben, subtle accordion from Gary, and again, the ethereal sound of Kate’s Dulcimer; it was altogether a spell-binding rendition. Another IoW inspired song written by Ben, the charming ‘Union Street’, was played next. And again, as perfect as the recorded version. Another Russian-sung song ‘Vengerka’ with a very Slavic vibe about it was performed next. Quite a remarkable song, this. Finally the first set finished with the Appalachian version of ‘Scarborough Fair’, called ‘Lovers’ Tasks’, which named different herbs to the traditional English song; and incorporated a Kate composed piece, ‘Black Tea Waltz’. The band then retired for a well-earned break. 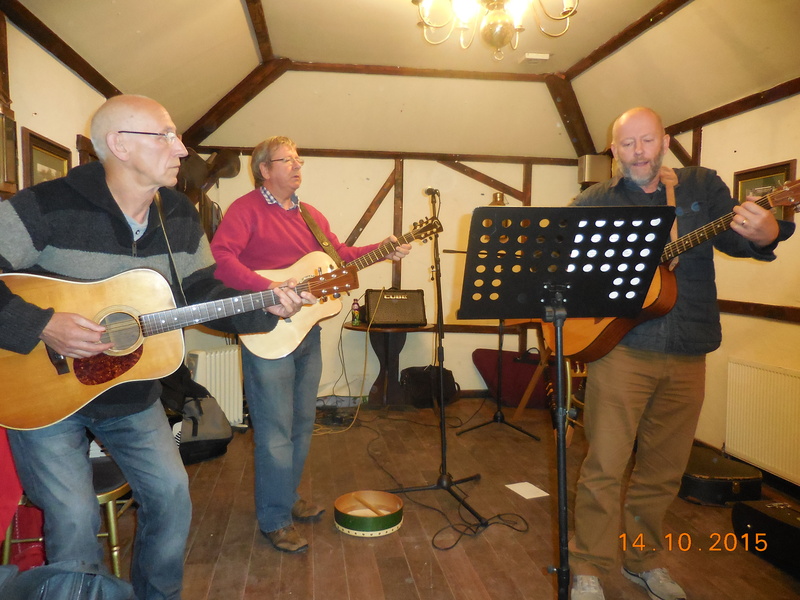 ‘The Elderly Brothers’ and more on a Russian theme: When proceedings were ready to resume, we were introduced to the ad hoc three-piece guitar band, ‘The Elderley Brothers’ – Dave, Ray, and Johnnie. They gave a fun performance of ‘Rollin’ In My Sweet Baby’s Arms’. 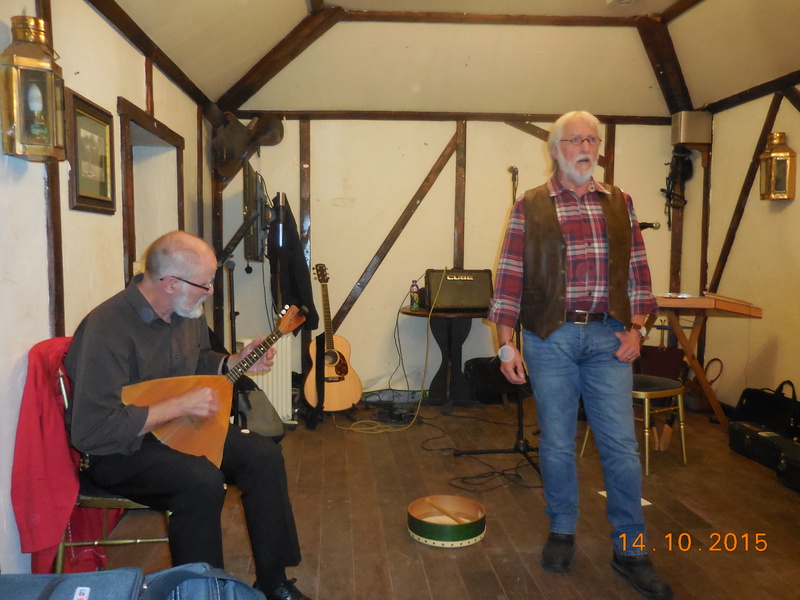 Club Chairman Peter was then joined by John and his Balalaika for ‘The Song Of The Volga Boatmen’ – sung in Russian – but Daria was the only one present who could accurately judge the performance! Kara’s Second Set began with a ‘…depressing Russian song’ – ‘Life Is Sweet me Lads’ – for which Daria taught us a few Russian words so that we could sing along. It wasn’t actually that depressing – rather, it was a bit of fun singing along. Nice vocal harmonies from Kate on this one. From the album, the Ben Honey written ‘Hunter’s Moon’ followed. It is his idyllic view of the countryside. It is another song that I’m familiar with; and again it was a fine rendition. And this was followed by another Ben-penned song: ‘Carousel Waltz’. It was a new one on me, and I quite liked it. The rather unusual ‘Stormteller’ was next. Its a lively number that I hadn’t previously heard. Then ‘Made Of Light’ was sung by Daria who was clearly moved whilst singing the poignant lyric. It is about the loss of a personal friend. Delving into the album once more, the band played ‘In Lille’ – about a young lady who is mistaken for a Lady Of The Night! 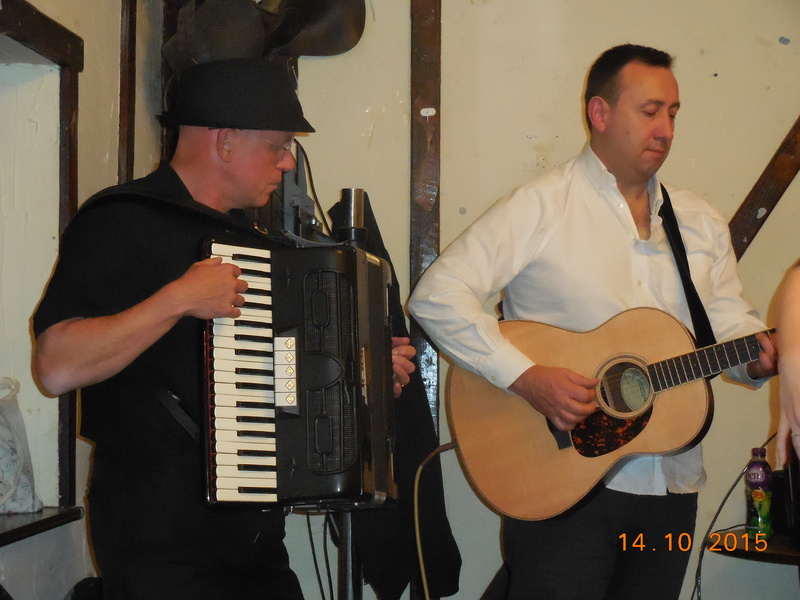 Gary’s accordion was highly appropriate for this very Gallic sounding song. ‘The Wedding Guest’ was played next. It is based on a banned poem by Russian Romantic poet Lermontov. It is another that is very Slavic in feel. Finally from the album again, Daria’s song ‘In Lunenburg’ (which is in Canada) ‘…where you can actually make a living there from busking’. It is a song with a very lively ending which had the audience clapping along. It was a good finishing number – and a great show altogether. Musicianship: All the songs of Daria’s two-part set had indeed been ‘a crazy cocktail’. I don’t think I’ve ever heard such a wide variety of style and genres performed in one night! And all performed with such impressive musicianship. It was a thoroughly entertaining show from the band. It was a mix of their old and new material, with a few trad numbers too. There looks to be a lot of songs practiced and ready for the next album, that’s for sure. Daria herself was impressive as usual, not only for her beautiful voice, but as a front-woman for the whole band; having a distinctive hair do, and wearing a striking red dress. She gave an interesting spoken explanation to each song – something that I always think is a necessity. And unlike her solo performances she was largely without personal instrumentation; which meant she was free to make expressive hand gestures whilst singing. She was animated throughout; and was obviously enjoying the night; and this adds to the visual effect of the performance. Her confidence seems to have improved no end too, compared to when I saw her before – although on that occasion she was solo, of course. 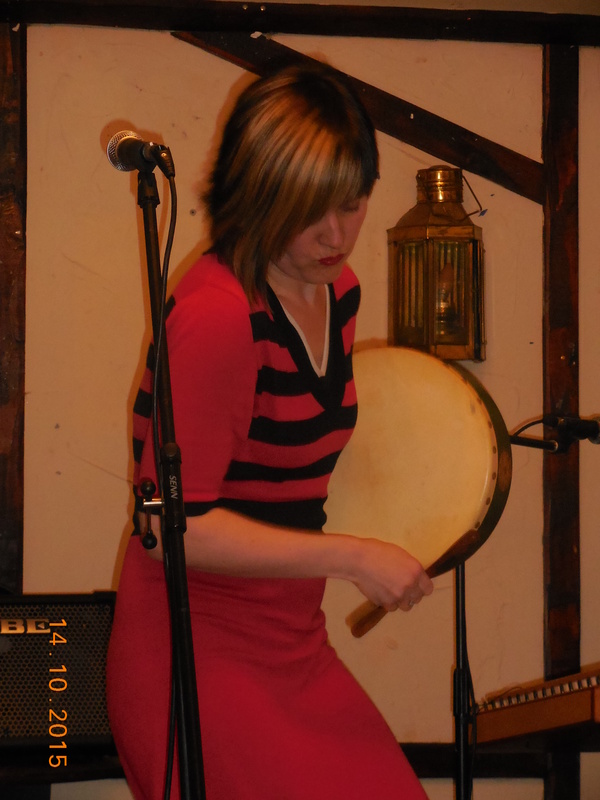 Kate was impressive too – mostly for her command of the dulcimer; but her vocal harmonies were good too. She was also interesting when she explained some songs as well. Ben’s acoustic guitar playing was obviously highly practiced and he was amusing when speaking of the fine songs that he’d written. Gary’s accordion playing was subtle and excellent. 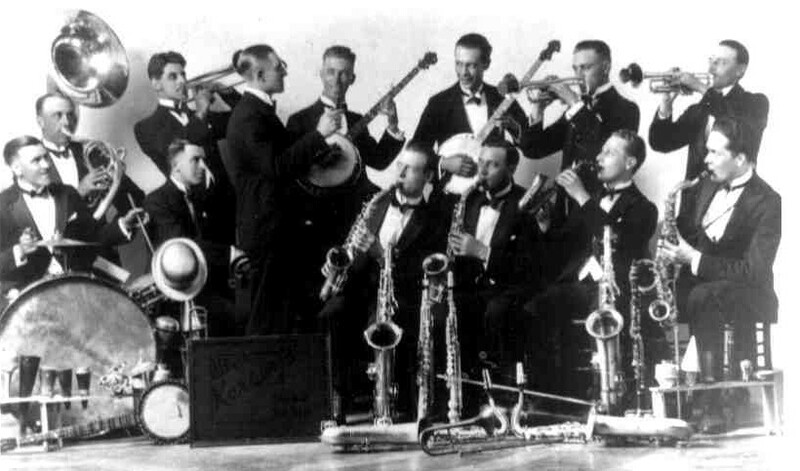 The instrument has the potential to dominate; but his playing enhanced the overall sound of the band to a high degree; making it unique. This entry was posted in Gig review and tagged ange hardy, ben honey, daria kulesh, esteesee, eternal child, foxen, gary holbrook, haverfolk, kara, kate rouse, lost horizons, mike batt, phil the music quill, waters so deep on October 22, 2015 by PTMQ.